The Maruti Suzuki India Limited has launched its eco friendly car, A-Star, a premium hatchback. The car is a perfect combination of style, powerful performance and comfort features. The car is a technological marvel that too at affordable price. It is a car lover’s dream come true. 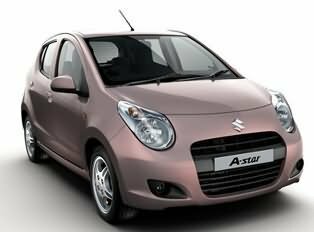 Maruti A-Star comes in nine beautiful colours namely – Desert brown, Paradise Blue, Healing Green, Silky Silver, Arctic White, Midnight Black, Bright Red, Sunlight Copper and Azure Grey. The front of the car is fitted with frog eye-shaped extended headlamps, wide open shaped grille slot, small leaf shaped fog lamp slot. The bonnet has wide swept nose design. The wide wheel arch has small turning lights. The front windscreen is fitted with intermittent wiper and washers. Maruti A-Star has a series of comfort features for the occupants. The comfort features include driver seat adjustment, power steering and Air conditioner. The car comes with integrated audio system with 4 speakers. Other comfort features include boot lid opener, fuel lid opener, front and rear electronic power windows, inside manual outside mirrors. The car is ultra spacious with sufficient legroom and head room for the occupants. There is enough storage space, 4 cup holders, dash integrated glove box and rear luggage shelf. The dashboard is mounted with speed sensitive three spoke urethane power steering wheel, sun visor with ticket holder, ash tray, accessory socket, key off reminder, vanity mirrors and rear luggage shelf. The car is also fitted with clock, odometer, fuel gauge and digital trip meter. Maruti A-Star has a host of safety features. The latest safety features include dual airbags, immobilizer, rear window defogger, door ajar warning light, child proof rear door locks, high mounted stop lamp, head light leveling, front wiper and washer with intermittent, front seat belt with pretensioners and force limiters, and RR CTR seat belt. Other safety features include advanced braking system which includes Anti-lock Braking System (ABS) and EBD. The Penta drive technology and Total Effective Control Technology (TECT) takes care of the safety aspect. The rigid body structure helps in absorbing the impact energy. Maruti A-Star is fitted with 998 cc, 3 cylinder, 12 valve, KB series, DOHC engine which produces a maximum power of 67 PS at the rate of 6200 rpm and a maximum torque of 90 Nm at the rate of 3500 rpm. It is incorporated with 5 speed manual transmission and 4 speed automatic transmission (only in LXi variant). The engine meets the new emission norms in India (BS IV) as well as Euro 4 and Euro 5. The engine has been equipped with multi-point fuel injection system.